Grader: Well struck with lots of Mint Red. 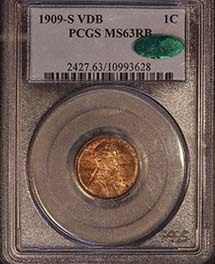 Grader: PCGS = $3500 A needle-sharp and carbon-free cent with a glossy, unperturbed appearance. 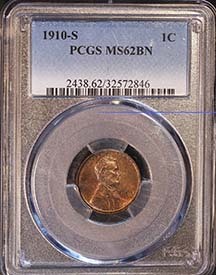 Obverse rim die breaks from 9 o'clock to 10:30 may be of interest to the specialist. 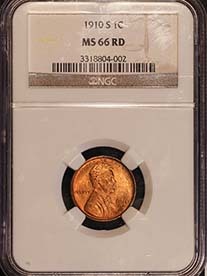 Grader: NGC Price Guide = $11,510.00 Pop = 1 None HIGHER!! Grader: Well struck with lots of Mint Red. PQ! Grader: "Gray sheet bid = $10,000. The design elements are sharply detailed and vibrant mint luster adds to the outstanding eye appeal. 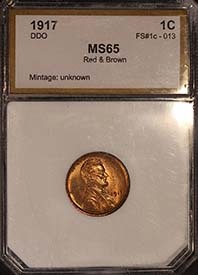 Population: 16 in 65 Red, 1 finer"
Grader: CAC, Quite a rare coin in Red. Nice mint red color. Grader: Boldly struck and fully red. 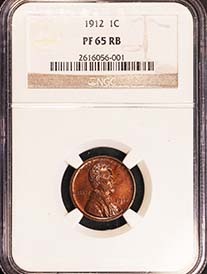 A very nice Red coin. CAC & PQ! Grader: Brilliantly mirrored fields reside beneath deep orange mint color that is starting to change to brown and pale blue. Grader: Type Two--Brilliant Finish. 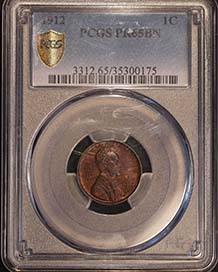 Both sides of this Gem proof are awash with orange-red brilliance, and each exhibits sharply struck design elements. This is a very pleasing eye appealing specimen. 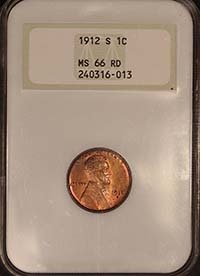 When the Lincoln one-cent coin made its initial appearance in 1909, it marked a radical departure from the accepted styling of United States coins, introducing as it did for the first time a portrait coin in the regular series. A strong feeling had prevailed against using portraits on our coins, but public sentiment stemming from the 100th anniversary celebration of Abraham Lincoln's birth proved stronger than the long-standing prejudice. The only person invited to participate in the formulation of the new design was Victor David Brenner. President Theodore Roosevelt was so impressed with the talents of this outstanding sculptor that Brenner was singled out by the President for the commission. 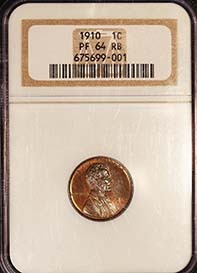 The likeness of President Lincoln on the obverse of the coin is an adaptation of a plaque Brenner executed several years earlier which had come to the attention of President Roosevelt. In addition to the prescribed elements on our coins -- LIBERTY and the date -- the motto In God We Trust appeared for the first time on a coin of this denomination. Of interest also is the fact that the Congress passed the Act of March 3, 1865, authorizing the use of this motto on our coins during Lincoln's tenure in office. 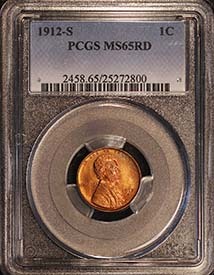 A study of three models for the coin's reverse resulted in the approval of a very simple design bearing two wheatheads in memorial style. Between these, in the center of the coin, are the denomination and UNITED STATES OF AMERICA, while curving around the upper border is the national motto, E Pluribus Unum, which means "One out of Many." Even though no legislation was required for the new design, approval of the Secretary of the Treasury was necessary to make the change. 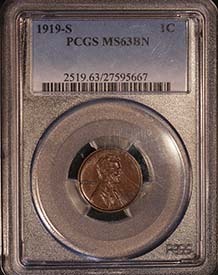 Franklin MacVeagh gave his approval on July 14, 1909, and not quite three weeks later, on August 2, 1909, the new coin was released to the public. The original model bore Brenner's name. 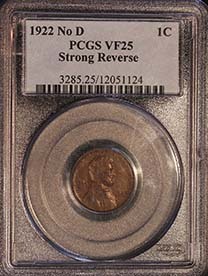 Before the coins were issued, however, the initials "VDB" were substituted because officials at the United States Mint felt the name was too prominent. After the coin was released, many protested that even the initials were conspicuous and detracted from the design. 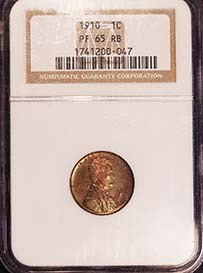 Because the coin was in great demand, and due to the fact that to make a change would have required halting production, the decision was made to eliminate the initials entirely. They were restored in 1918, and are to be found in minute form on the rim, just under the shoulder of Lincoln. 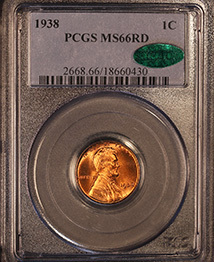 There are more one-cent coins produced than any other denomination, which makes the Lincoln cent a familiar item. 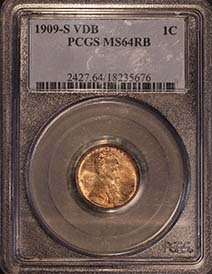 In its life span, this coin has weathered two world conflicts, one of which changed it materially, because metals play a vital part in any war effort. 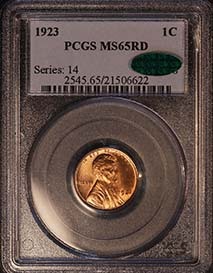 At the time of World War II, the one-cent coin was composed of 95 percent copper and 5 percent zinc. These metals were denied to the Mint for the duration of the war, making it necessary for the Mint to seek a substitute material. After much deliberation, even including consideration of plastics, zinc-coated steel was chosen as the best in a limited range of suitable materials. 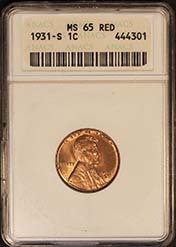 Production of the war-time cent was provided for in an Act of Congress approved on December 18, 1942, which also set as the expiration date of the authority December 31, 1946. Low-grade carbon steel formed the base of these coins, to which a zinc coating .005 inch thick was deposited on each side electrolytically as a rust preventative. The same size was maintained, but the weight was reduced from the standard 48 grains to 42 grains, due to the use of a lighter alloy. 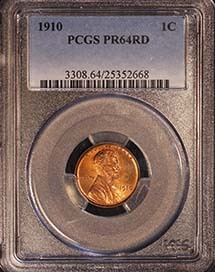 Production commenced on February 27, 1943, and by December 31, 1943, the three Mint facilities had produced 1,093,838,670 of the one-cent coins. The copper released for the war effort was enough to meet the combined needs of 2 cruisers, 2 destroyers, 1,243 flying fortresses, 120 field guns and 120 howitzers, or enough for 1.25 million shells for our big field guns. 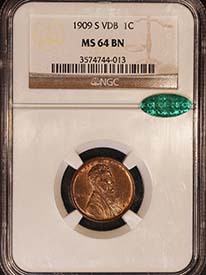 On January 1, 1944, the Mint was able to adopt a modified alloy, the supply being derived from expended shell casing which when melted furnished a composition similar to the original, but with a faint trace of tin. The original weight of 48 grains was also restored. On February 12, 1959, a revised reverse design was introduced as part of the 150th anniversary of Lincoln's birth. No formal competition was held. 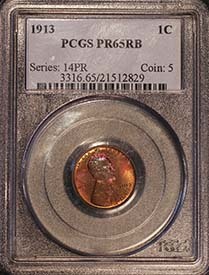 Frank Gasparro, then Assistant Engraver at the Philadelphia Mint, prepared the winning entry, selected from a group of 23 models that the engraving staff at the Mint had been asked to present for consideration. Again, only the approval of the Secretary of the Treasury was necessary to make the change because the design had been in use for more than the required 25 years. The imposing marble Lincoln Memorial provides the central motif, with the legends E Pluribus Unum and UNITED STATES OF AMERICA completing the design, together with the denomination. The initials "FG" appear on the right, near the shrubbery. 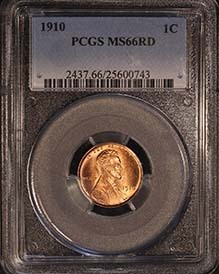 The composition of the coin was changed again in 1962. Mint officials felt that deletion of the tin content would have no adverse effect on the wearing qualities of the coin, whereas, the manufacturing advantages to be gained with the alloy stabilized at 95 percent copper and 5 percent zinc would be of much benefit. Congressional authority for this modification is contained in an Act of Congress approved on September 5, 1962. 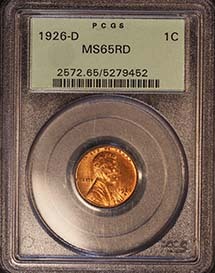 In 1982, the coin's composition changed again to copper-plated zinc. 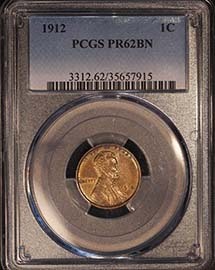 These coins, which are still being produced today, contain 97.6 percent zinc and 2.4 percent copper. 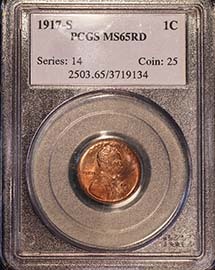 This coin is identical in size and appearance to the predominantly copper cent issued before 1982, but this modification saves the Government an estimated $25 million in metal costs every year.